Andean cultures developed a mysterious form of writing that has never been deciphered. Scientists are teaming with locals to solve the enigma. 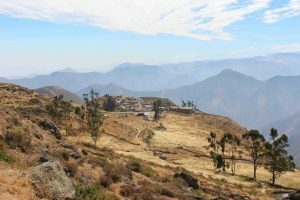 In July 2015, my husband and I were crammed into a stuffy minivan with 12 others, climbing out of Lima’s coastal mist into the sun-filled mountains thousands of feet above. After hours of dust clouds and dizzying hairpin turns, our destination appeared below—the remote Andean village of San Juan de Collata, Peru. It was a scattering of adobe houses with no running water, no sewage, and electricity for only a couple of homes. The several hundred inhabitants of this community speak a form of Spanish heavily influenced by their ancestors’ Quechua. Arriving at the village felt like entering into another world. 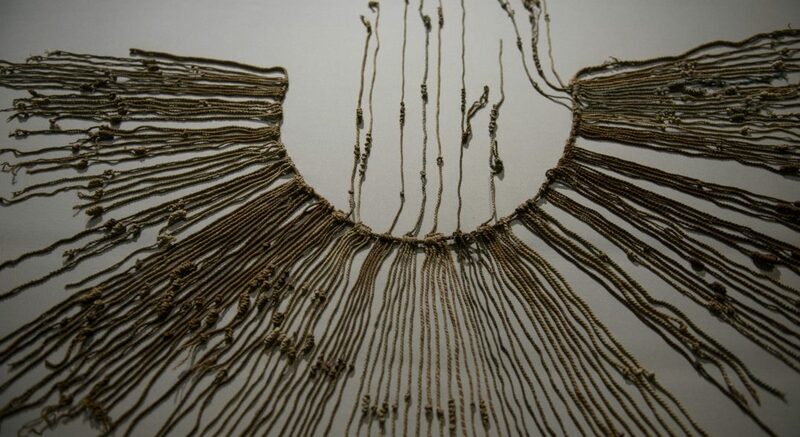 My husband and I spent our first few hours in Collata making formal presentations to the village officers, requesting permission to study two rare and precious objects that the community has guarded for centuries—bunches of twisted and colored cords known as khipus. After dinner, the man in charge of the community treasures, a middle-aged herder named Huber Brañes Mateo, brought over a colonial chest containing the khipus, along with goat-hide packets of 17th- and 18th-century manuscripts—the secret patrimony of the village. We had the tremendous honor of being the first outsiders ever allowed to see them. Over the next couple days, we would learn that these multicolored khipus, each of which is just over 2 feet long, were narrative epistles created by local chiefs during a time of war in the 18th century. But that evening, exhausted yet elated, my husband Bill and I simply marveled at the colors of the delicate animal fibers—crimson, gold, indigo, green, cream, pink, and shades of brown from fawn to chocolate. In the Inca Empire’s heyday, from 1400 to 1532, there would have been hundreds of thousands of khipus in use. Today there are about 800 held in museums, universities, and private collections around the world, but no one knows how to “read” them. Most are thought to record numerical accounts; accounting khipus can be identified by the knots tied into the cords, which are known to represent numbers, even if we don’t know what those numbers mean. According to Spanish chroniclers in the 16th century who saw khipus still being used, others record narrative information: histories, biographies, and communications between administrators in different towns. Discovering a narrative khipu that can be deciphered remains one of the holy grails of South American anthropology. 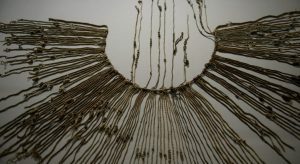 If we could find such an object, we might be able to read how Native South Americans viewed their history and rituals in their own words, opening a window to a new Andean world of literature, history, and the arts. Until recently, scholars believed that the khipu tradition died out in the Andes soon after the Spanish conquest in 1532, lingering only in the simple cords made by herders to keep track of their flocks. Yet, in the 1990s, anthropologist Frank Salomon discovered that villagers in San Andrés de Tupicocha, a small rural community in the same province as Collata, had continued to make and interpret khipus into the early 20th century. In San Cristóbal de Rapaz, to the north, he found that local peoples guarded a khipu in their ritual precinct that they revere as their constitution or Magna Carta. Although the inhabitants of these villages can no longer “read” the cords, the fact that these khipus have been preserved in their original village context, which is incredibly rare, holds the promise of new insights into this mysterious communication system. Since 2008, I have been conducting fieldwork in the central Andes, searching for communities whose khipu traditions have endured into modern times. In Mangas, a village north of Collata, I studied a hybrid khipu/alphabetic text from the 19th century, while in Santiago de Anchucaya, a community near Tupicocha, I discovered that villagers used accounting khipus until the 1940s. Meche Moreyra Orozco, the head of the Association of Collatinos in Lima, had contacted me out of the blue about a year before our trip to Collata. She wanted to know if I wished to visit her natal village where, she said, two khipus were preserved. In Lima, Meche had seen the National Geographic documentary Decoding the Incas about my research on khipus in the central Andes, and therefore knew that I was an expert on the khipus of the region. Meche understood that the Collata khipus were a vital aspect of Peru’s cultural heritage. Meche and I negotiated for months with the village authorities to allow me access to the khipus; she kindly hosted my husband and me in her home in Collata while we were there. From our first morning in Collata, we had 48 hours to photograph and take notes on the two Collata khipus and the accompanying manuscripts—a daunting task, given their complexity. 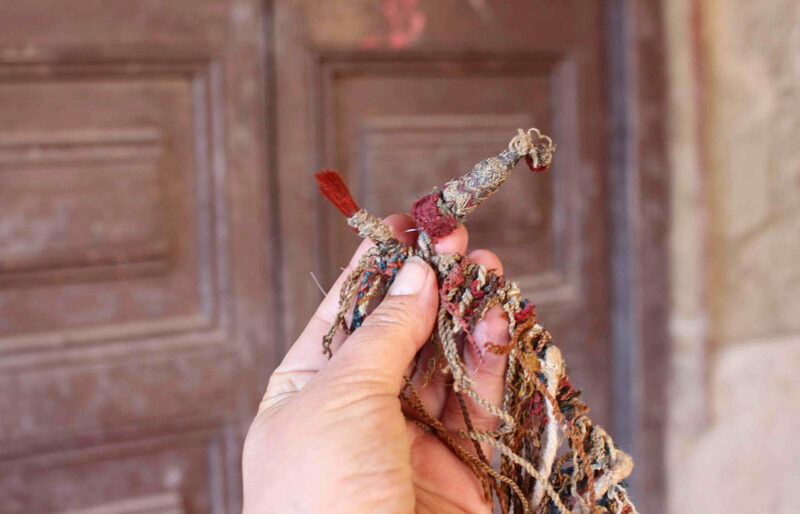 Each khipu has over 200 pendant cords tied onto a top cord almost as long as my arm; the pendant cords, averaging a foot in length, are divided into irregular groupings by cloth ribbons knotted onto the top cord. Like about a third of the khipus known today, these contained no knots coding for numbers. While I examined the khipus, Bill, an expert in medieval history with experience reading ancient Latin manuscripts, skimmed the documents, which were written in antiquated Spanish. When I later questioned elderly men in Collata about the khipus, they told me that the khipus were letters (cartas) written by local leaders during their battles in the 18th century. Until a few years ago, the khipus’ existence was a fiercely guarded secret among the senior men, who passed the responsibility for the colonial archive to younger men when they reached maturity. The role of the Collata khipus in 18th-century warfare echoes Salomon’s finding that khipu communications played a part in a 1750 rebellion slightly to the south of Collata. The text of an 18th-century khipu missive used in the 1750 revolt survives, written out in Spanish by a local colonial official, even though the original khipu has disappeared. Why did locals use khipus instead of alphabetic literacy, which they also knew? Presumably because khipus were opaque to colonial tax collectors and other authorities. The secrecy would have afforded them some protection. The Collata khipus, I discovered, were created as part of a Native rebellion in 1783 centered in the two villages of Collata and neighboring San Pedro de Casta. The General Archive of the Indies in Seville, Spain, houses over a thousand pages of unpublished testimony from captured rebels who were interrogated in prison in 1783; their words tell the story of this revolt. Felipe Velasco Tupa Inca Yupanki, a charismatic merchant who peddled religious paintings in the mountains, declared a revolt against Spanish rule in the name of his brother the Inca emperor, who, he claimed, lived in splendor deep amid the eastern rainforests. 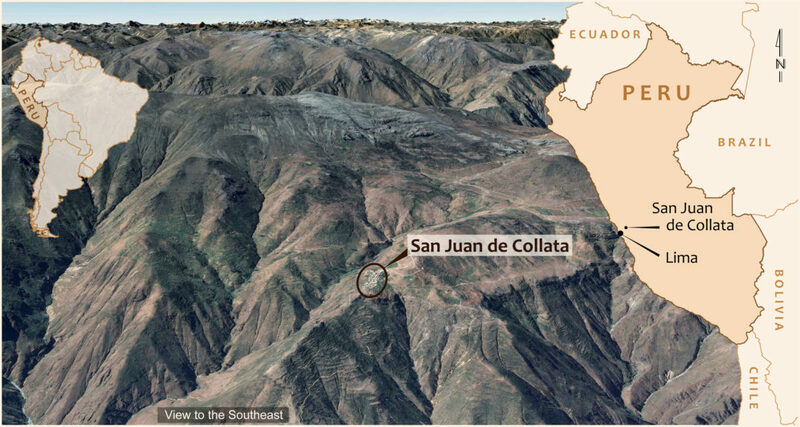 Testimony from captured rebels recounts that Yupanki ordered the men of Collata and neighboring villages to lay siege to the capital of Lima, with the goal of placing his brother—or more likely himself—on the throne of Peru. In January 1783, Yupanki spent two weeks in Collata, stirring revolutionary fervor and appointing the mayor of Collata as his “Captain of the People.” Dressed in a lilac-colored silk frock coat, with mauve frills at his neck, Yupanki must have cut a striking figure. His attack on Lima had scarcely begun when a confederate betrayed him by reporting the conspiracy to the regional Spanish administrator. A small band of Spanish troops captured Yupanki and his associates, and, despite a fierce ambush by rebels from Collata and Casta, successfully carried him to prison in Lima. There he was tortured, tried, and executed. Reading through the trial notes, it’s clear that the most damning evidence against Yupanki were letters detailing the conspiracy, written on paper in Spanish and found among his possessions. His main lieutenants also carried alphabetic letters that discussed their efforts to raise troops, providing unassailable proof of their guilt. 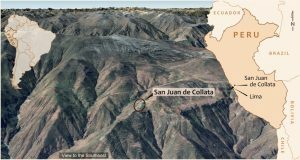 Spanish authorities never found comparable written letters among the rebel leaders in Collata, despite plentiful witness testimony implicating them in the rebellion. The Collata leadership completely escaped prosecution, all the while guarding their war khipus in their cherished archive. How did the Collata khipus encode their messages? My analysis suggests that these khipus may be logosyllabic, meaning that they record their messages through a combination of phonetic and ideographic symbols. The pendants have 95 different combinations of color, fiber type, and direction of ply, which seem likely to code for different sounds or syllables; other logosyllabic languages typically have 80 to 800 different symbols in their writing systems. Each khipu, with a couple of hundred pendants, might reasonably hold 150 words, about twice the length of this paragraph. According to local village tradition, the first khipu was created in the 18th century by the head (jefe) of Collata’s leading lineage, which is called Alluka. If you hypothesize that the first khipu was signed at the end with the lineage name, Alluka, then the last three pendants should stand for A, LLU, and KA. Interestingly, the last pendant in this sequence is blue, and the local word for blue was ankas; perhaps the KA comes from the color name. This information can then be used to decipher the end of the second khipu: Its pendants sound out A, KA, which is followed by a final, unknown syllable. This last pendant is a golden-brown color called paru. If that pendant stands for PAR, then the second khipu might reasonably sound out Yakapar, one of only two lineage names in Casta. Other signs seem to represent entire words or ideas; for example, villagers told me that the brush of bright red deer hair at the beginning of one of the khipus indicates that the khipu is about warfare on behalf of the Inca king. The Collata khipus are the first authentic khipus ever theorized convincingly to be logosyllabic. If confirmed, this will be the first discovery of a unique, previously unknown form of logosyllabic writing—one that communicates sounds through three-dimensional animal fiber cords that must be felt as well as seen. This raises a host of questions. Were these logosyllabic khipus a local phenomenon influenced by contact with Spanish writing, or do they have far-reaching roots in the pre-Columbian Andean past? Do the other types of khipus that were used in the central Andes until the 20th century, such as those for accounting, share features with phonetic khipus? What are the implications of a three-dimensional writing system, in which the sense of touch plays as important a role as sight, and how does this expand our understanding of what “writing” is? On June 24, 2017, which is the official feast day of the village, the village council and the president of the Collata Peasant Association formally inducted a Spanish translation of my Current Anthropology report on their khipus into their treasured archive. 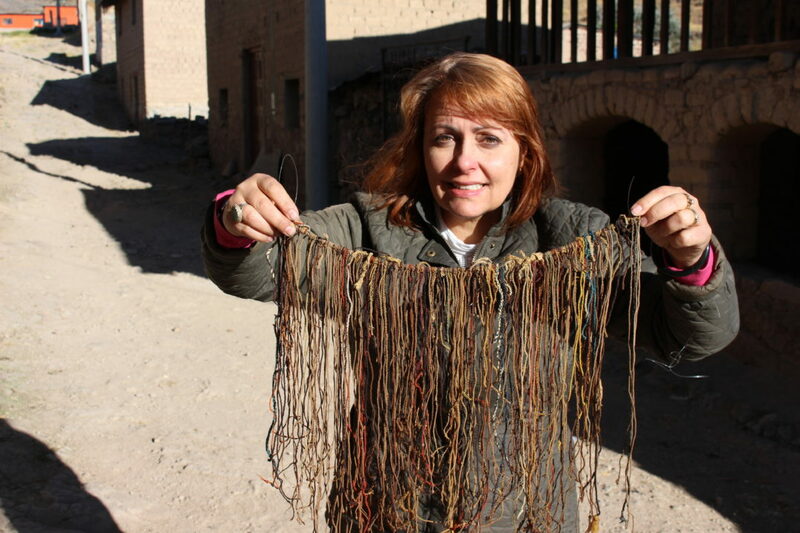 The extraordinary khipu texts of the central Andes, including the logosyllabic animal fiber cords, are a proud testament to the intellectual achievements of Native American peoples, and my research team and I are just beginning our efforts to decipher the Collata khipus. We will be working with the people of the region for years to come, to gain even greater understanding of their fascinating history and culture, and if we are lucky, we might even unlock the mysterious and unique code of their ancestors. This entry was posted in Andes, History, Language, Linguistics. Bookmark the permalink.